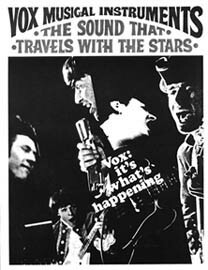 The Vox Ultrasonic XII guitar was offered in the 1967 "Vox, It's Whats Happening" and the 1968 "The Sound That Travels With the Stars" catalogs. A black and white reprint of either of these catalogs is available at North Coast Music. The V275 Ultrasonic XII includes all the electronic outboard effects included on the six string V268 Ultrasonic guitar: E-tuner, treble and bass booster, distortion booster, and repeat percussion. Oddly, it also included a vibrato arm. The 1968 US Vox catalog catalog described the V275 Ultrasonic XII as follows: "An exciting double cutaway 12-string electric acoustic guitar. Has built-in E tuner, distortion booster, treble and bass booster, Wah-Wah, repeat percussion. 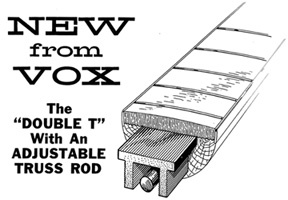 Completely redesigned easy-to-fret fast-neck with VOX double T-bar and adjustable steel rod. Has two exclusive VOX Ferro-Sonic wide range high output pickups. One volume and two-tone controls. 3 position pickup selector switch. Has chrome plated machine heads. Sunburst or Cherry." The 1968 US Vox price list indicated that the retail price of the Ultrasonic XII guitar was $475 USD. In today's dollars, the Ultrasonic XII would retail for about $3000. The Ultrasonic XII guitar was produced for Vox in Italy by EKO in Recanati Italy. A decal on the back of each guitar states: "Made for Vox in Italy." The circuitry for all the onboard effects in the Ultrasonic guitar was designed into a single module. In some cases, this module was sealed and encapsulated, making it not repairable or replaceable. Additionally, the Vox service schematic for this guitar includes no electronic service or repair information on these modules. If you find that changing the 9 volt battery that powers the internal effects does not correct a malfunctioning effects circuit, it is likely that the onboard features are permanently inoperative. Replacement effects modules have not been available for over twenty years. EKO made Vox guitars for the US market were first shipped to the American distributor of EKO, LoDuca Brothers Musical Instruments Inc in my home town of Milwaukee WI. After inspection, the guitars were then forwarded to the American distributor of Vox, Thomas Organ.